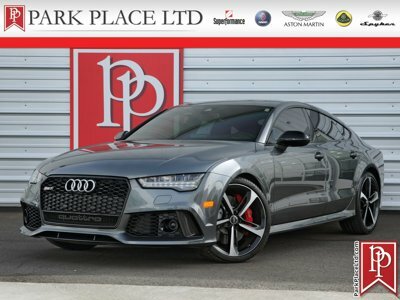 Find a great sale price on this 2016 Audi RS 7 at Park Place Aston Martin in Bellevue, WA. This 2016 Audi RS 7 is located at our dealership in Bellevue. If you're looking for a great price on this 2016 Audi RS 7 or just looking to get an auto loan for the vehicle you want... you've come to the right place! Park Place Aston Martin. ONLY 375 MILES FROM NEW!! This 2016 Audi RS 7 finished in Misano Red Pearl Effect with a Black Leather Interior is 'In The Wrapper' condition throughout. Powered by a monstrous 4.0L twin-turbocharged V8 producing 560hp/516lb-ft of torque and backed by a ZF-sourced 8-speed automatic transmission. All of this power is put through Audi's amazing Quattro All-Wheel Drive system. This sensational RS 7 carried an original MSRP of $114,350 MSRP with factory options consisting of; Driver Assistance Package (Audi Adaptive Cruise Control, Audi Pre-Sense Plus, Audi Active Lane Assist, Corner View Camera System, High-Beam Assistant), Sport Exhaust with Black Tips, Cold Weather Package (Heated Rear Seats, Heated Steering Wheel), and the Misano Red pearl effect paint ($575). Standard equipment consists of; 20" Forged 7-Twin-Spoke-RD Design Wheels, Electronic Stability Control (ESC), Audi Drive Select, Energy Recuperation without Start-Stop Technology, Tire Mobility Kit, Power Sunroof, Full LED Headlights (DRL's. low/high beams, turn signals), Auto-Dimming/Power-Folding/Heated Exterior Mirrors, Auto-Dimming Interior Mirror, Front RS 7 Heated and 12-Way Power Front Seats with Driver Memory, 3-Spoke Flat-Bottom Leather-Wrapped Multifunction Steering Wheel with Shift Paddles, Valcona Leather Seats, Carbon Fiber Inlays, Four-Zone Automatic Climate Control, Bose Surround Sound, Head-up Display, Audi Navigation Plus with MMI Touch, Sirius Satellite Radio, Audi Connect, Audi Side Assist, Audi Advanced Key, Garage Door Opener, Preparation for Mobile Phone (Bluetooth), and Parking System Plus with Rearview Camera. It is a 1-Owner car and the full warranty in effect until January 2020 or 50k miles. This car represents an excellent opportunity to put an absolutely 'LIKE NEW' 1-owner with under 300 miles Audi RS7 in your garage with significant savings off the original sticker. Books, Records, Keys. The headlights and taillights were redesigned for the 2016 model year and the revamped model year brings a look that's still menacing, but not over-the-top. As well, the graphics have been updated throughout and an upgraded MMI system makes using the cars media systems easy. It also features upgrades to the driver information screen, as it is now larger. Remarkable agility and an interior that's both stylish and comfortable compliment the exterior stylings and engine, along with its ultra-aggressive exhaust tone, perfectly. The RS 7 has no problem getting attention and is certainly one of Audi's best overall cars on the road today. For more information on this pristine 2016 Audi RS 7 or any of our other 100+ Exotic, Sports, and Special Interest cars always in our inventory, contact our friendly and knowledgeable sales team, or always feel free to drop by our 40,000+ sq. ft. of Indoor Showrooms in Bellevue, WA - Home of the West Coast's Most Exciting Inventory of Luxury, Exotic, High Performance and Collectible Automobiles. With 200+ Always On Site, Nobody Has What We Have!